Andy Goldfine (Mr. Aerostich), who introduced a generation of motorcyclists to "Better Riding through Chemistry" via his Cordura/Goretex gear, surprised a lot of 'Stichies like myself by releasing a new jacket and pants combo made from...leather. But don't worry, Aerostich isn't going all retro on us, because you see, the Transit suit is made from waterproof cows. Perhaps Farmer Jones fed his heard a Goretex diet, or maybe the smart folks at Gore finally figured out a way to bond Goretex to leather. 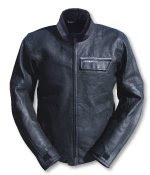 In any event, does the Transit provide a happy marriage of abrasion-resistant leather to the all-weather comfort of Aerostich's textile offerings? Well, I can't tell you firsthand. Though Andy G. has been velly, velly good to me over the years, I don't believe he was going to hand over one of his new $1500 Transit suits for me to monkey with. So instead, go read GabeUnchained's review of the Transit, re-posted on his blog from famed San Francisco publication City Bike.